2013 trailer for my show Witches! the Musical. This trailer contains clips from the October 2012 community theater premiere at the Lincoln Theater in Mount Vernon, WA. 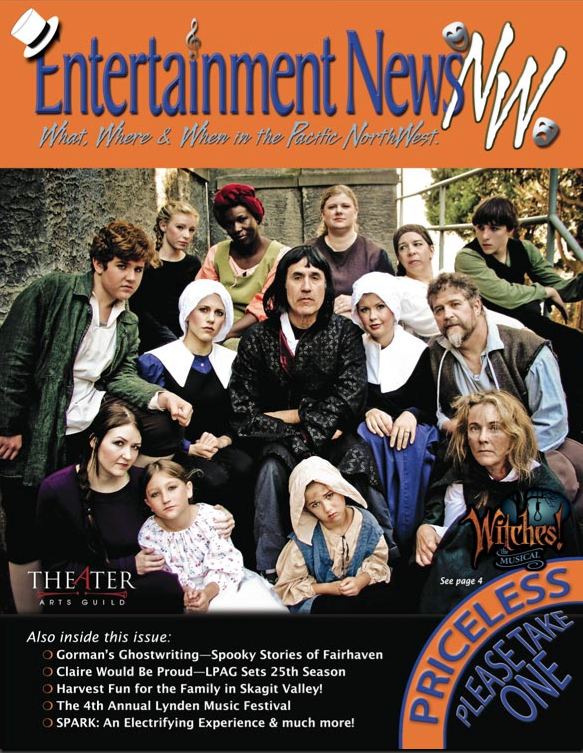 The next run of this Salem musical will be June 2014 at the Whitby Courthouse Theater in Ontario, Canada. Thank you so much for the awesome support of the Theater Arts Guild, cast, crew and local audiences. It was a very exciting and fulfilling run for us and your feedback was very generous in helping us bring the show to it’s next level. 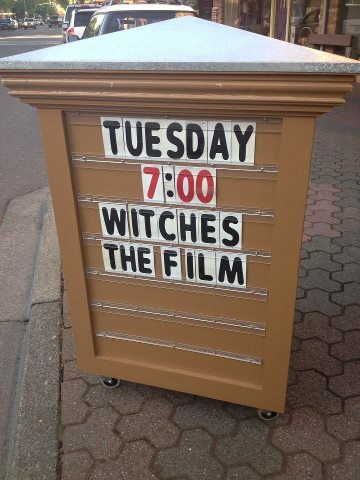 On Tuesday, April 30, 2013 at 7pm the Historic Lincoln Theater in Mount Vernon, WA will host a free public video showing of Witches! the Musical recorded during it’s October 2012 premiere run. This is a fundraising event for the Lincoln Theater Digital Futures Initiative. The event will include presentations by Theater Arts Guild (TAG) and members of the creation team. Witches! 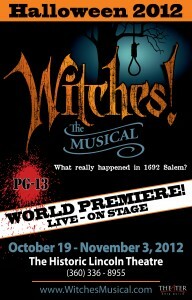 is a new musical about the 1692 Salem Witch Trials. The story contains many of the historical people involved in the trials including Bridget Bishop, Dr. William Griggs, Abigail Williams, Rev. Samuel Parris, Giles Corey and the Circle Girls. Visit the show website: Salem Witch Trial Musical. Theater Arts Guild presents Witches! 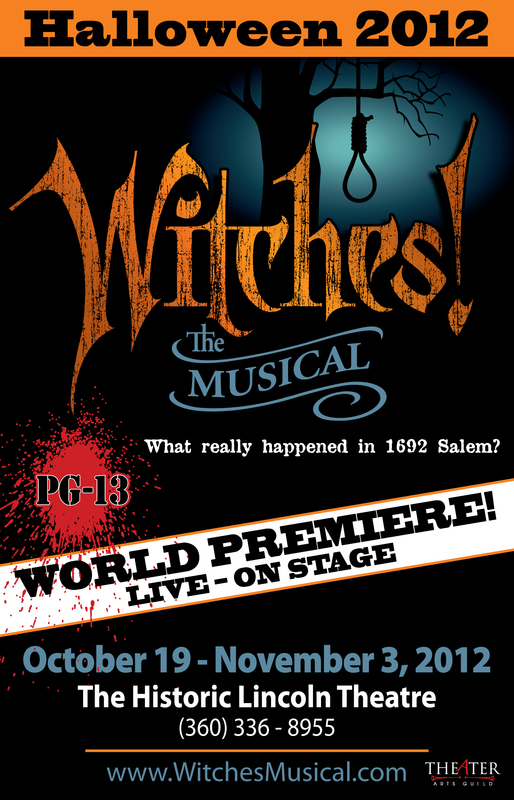 the Musical, a Halloween world premiere production based on historical events of the 1692 Salem Witch Trials. Famous historical characters come to life with a cast over 30 strong as Witches! the Musical portrays the dark events of the Salem Witch Trials with a spine tingling score of rock, hip hop, classical and 20th century music styles mixed with satire, fantasy, fact and fiction. Directed by Jane Skinner with book, music and lyrics by Conrad Askland. Rated PG-13 for content. 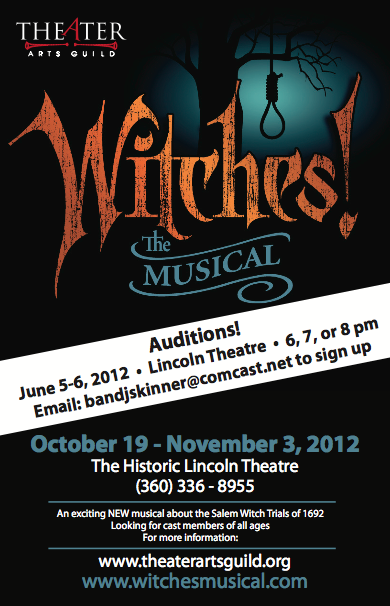 More info at www.WitchesMusical.com or call the Lincoln Theater at 360-336-8955 for tickets. A trailer for the 2012 premiere of Witches! the Musical. The video contains excerpts from the show score. A combination of classical, pop, rock and hip hop music styles. I’m working on a theater piece and developing plot points between scenes and characters. It’s like being a detective going through the dramatic arcs of a scene and bridging the scenes together. Then matching motivation and obstacles so they are balanced and realistic. I was looking up information about setting up a staged reading for a new musical. Found these staged reading guidelines from Actor’s Equity. Great Stephen Schwartz interview with Ernie Manouse. Lots of insight into musical theater and composition for music theater. The Theater Wittenbergs sustaining institution, a special purpose association, has resolved to close the theatre beginning in summer 2001. The decision will affect 156 jobs. A theatre for children and young people and a project-based music theatre will remain in operation. Wittenberg has a long tradition in cultural events. The City Theatre Mitteldeutsches Landestheater reached a great importance in GDR times. 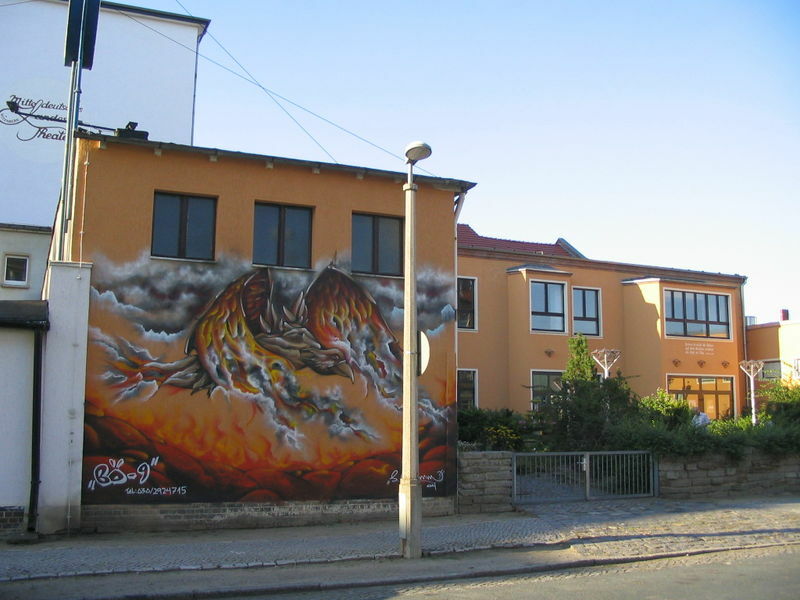 Since 1996, the City proposes Open-Air theatre shows based on the Lutheran history still alive in many historical places of the ancient town. As highlights, in 2001 and 2005, Fernando Scarpa became the artistic director of the “BÃ¼hne Wittenberg” (Stage Wittenberg), a project for theatre, art and culture in the whole of Germany which attracts to the City plenty of audience and whose success achieves European echo. Hamlet is said to have studied here. On November 9, 1938, the Nazis unleashed a series of riots against the Jews in Germany and Austria. In the space of a few hours, thousands of synagogues and Jewish businesses and homes were damaged or destroyed. For the first time, tens of thousands of Jews were sent to concentration camps simply because they were Jewish.Â This event came to be called Kristallnacht (“Night of the Broken Glass”) for the shattered store windowpanes that carpeted German streets. “Those that do not learn history are forced to repeat it.” Never forget. [Les Miserables] 10th anniversary – 17 VALJEAN Do you hear the people sing. Stephen Sondheim talks about the writting of Send in the Clowns from A Little Night Music – with excerpts of the rehearsal with Sally Ann Howes. Insight into Sondheim’s composing process – he says he does not let lyrics or melody get too far ahead of each other during the writing process. Sondheim says he likes to know how a song will end when he starts it. The song ‘Evening bells’ in russian (Ð’ÐµÑ‡ÐµÑ€Ð½Ð¸Ð¹ Ð·Ð²Ð¾Ð½ – Vecherny svon – Abendglocken – Les cloches du soir) by Ivan Rebroff. This song brings back memories. My father used to endlessly play a record of Ivan Rebroff singing “Evening Bells”. One of my favorite Russian songs.